Since its publication in 1960, William L. Shirer’s monumental study of Hitler’s German empire has been widely acclaimed as the definitive record of the twentieth century’s blackest hours. The Rise and Fall of the Third Reich offers an unparalleled and thrillingly told examination of how Adolf Hitler nearly succeeded in conquering the world. With millions of copies in print around the globe, it has attained the status of a vital and enduring classic. Now, years after the end of World War II, it may seem incredible that our most valued institutions, and way of life, were threatened by the menace that Hitler and the Third Reich represented. Shirer’s description of events and the cast of characters who played such pivotal roles in defining the course Europe was to take is unforgettable. Benefiting from his many years as a reporter, and thus a personal observer of the rise of Nazi Germany, and availing himself of some of the 485 tons of documents from the German Foreign Office, as well as countless other diaries, phone transcriptions, and other written records, meticulously kept at every level by the Germans, Shirer has put together a brutally objective account of how Hitler wrested political control of Germany, and planned and executed his six-year quest to dominate the world, only to see Germany go down in flames. Although 1600 pages long, this is such a richly rewarding experience for anyone who wants to come to grips with the mysterious question of how this menace to civilization ever came into being, much less was sustained for as long as it was. The answer, unfortunately, is that most of Germany, for a whole host of reasons, embraced Nazism and the fanaticism that Hitler engendered. Since its publication in 1960, William L. Shirer’s monumental study of Hitler’s German empire has been widely acclaimed as the definitive record of the twentieth century’s blackest hours. The Rise and Fall of the Third Reich offers an unparalleled and thrillingly told examination of how Adolf Hitler nearly succeeded in conquering the world. With millions of copies in print around the globe, it has attained the status of a vital and enduring classic. Now, years after the end of World War II, it may seem incredible that our most valued institutions, and way of life, were threatened by the menace that Hitler and the Third Reich represented. Shirer’s description of events and the cast of characters who played such pivotal roles in defining the course Europe was to take is unforgettable. Although 1600 pages long, this is such a richly rewarding experience for anyone who wants to come to grips with the mysterious question of how this menace to civilization ever came into being, much less was sustained for as long as it was. The answer, unfortunately, is that most of Germany, for a whole host of reasons, embraced Nazism and the fanaticism that Hitler engendered. A very interesting and educational book. Very well written. What I liked the most about this book is that it was written by someone that was there. Many of the events described were from first hand observations from his notes as a journalist. Don't let the size of this book intimidate you. It is easy to follow and understand. If you know nothing about German history you will not be at a loss. this is the perfect book to read if you want to learn how a society of good people can be lead down a road that can only end in tragedy of epic proportion. Fantastic, comprehensive story of German in the first half of the 20th century. While there is some criticism leveled against the content of this book, it really is a fantastic look at how Hitler and his cronies came to rule - and ultimately lay waste to - Germany. The narrator, Grover Gardner, reads in a lively, engaging way. Having just finished listening to this book today, I will miss his dulcet tones guiding me through what is a monumental work of literature. After listening to Scott Anderson's "Lawrence in Arabia", the first thing that came to mind was 'ok, what happened next'. Shirer's book explains what happened next. The work reveals how human intelligence decreases according to the inverse square law as more people are added to the count. By the time one gets up to country size, the best that can exist is an idiot. So when one insane psychopathic genius, Hitler (believe it or not, he was a pretty decent painter), decides to exploit the extraordinarily silly Versaille Treaty, the world lines up like dominoes. Yeah, this audiobook is long-- really long-- but,well worth listening to. Despite being hugely opinionated, it remains hugely savvy. Shirer was in Austria and Germany and saw much of what he relates happen. He saw Neville Chamberlain drool, continuing the British talent for dropping the ball at the most inopportune moment-- one would have thought this country's efforts during WW1 couldn't have been surpassed. Wrong. There's a lot of plain speaking in this book. Shirer has no politically correct qualms about calling idiots idiots. Brilliant writing, brilliant reading, depressing assessment of what happens when too many, or too few people make decisions. 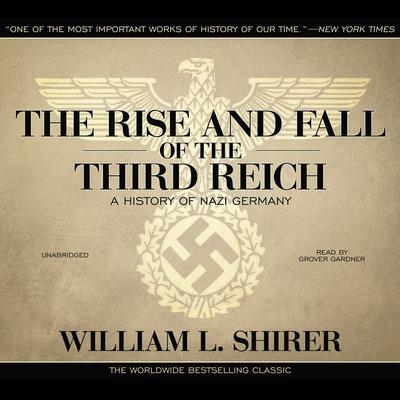 William L. Shirer's The Rise and Fall of the Third Reich is considered a classic for valid reasons. It helps the reader make their way through the torturous path Germany took to fascism. The information is presented in a clear chronological format. Having lived in Europe through most of the events discussed, Mr. Shirer has a unique perspective on history. The narration by Mr. Gardner is first rate.